The First Echo: The 'Jem and the Holograms' Movie: Should We Be Concerned? The 'Jem and the Holograms' Movie: Should We Be Concerned? Earlier today, the director of G.I. 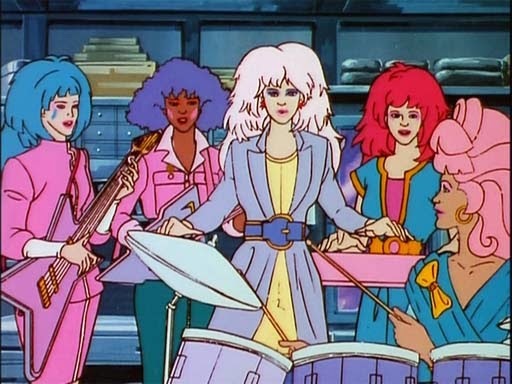 Joe: Retaliation, John M. Chu, announced that he is planning to make a big-screen adaptation of a cult cartoon classic that ran for three years in the 80s: Jem and the Holograms. He made the announcement via YouTube along with Jason Blum, hotshot producer of hits like The Purge and the Paranormal Activity franchise, and Scooter Braun...Justin Bieber's manager. Let those last two sentences sink in for a moment. These three dudes are clearly (and admirably, if I might add) capitalizing on a property that carries a crapload of nostalgia...and fans. However, they're asking those fans to contribute to the development of the movie -- because crowdsourcing is soooo 2014. Thankfully they're not asking for financial support -- because that would come across as an extremely douchey move since the combined income of this trio could probably finance a small country. They're just asking for our advice. Free consultation services from the public. Some die-hards are understandably concerned, me included. And Twitter has already opened a floodgate of comments. Should we be concerned? The Hollywood Reporter has already mentioned that the adaptation will be a modern one, taking place in the present, even though a period piece set in 1987 would clearly be more fun (if you ask me). And why should we place our collective moviergoer trust in a couple of guys who probably never understood the meaning of "Showtime Synergy" until last week? UPDATE 4/24/14: You can now get a visual of what this thing may look like now that they've announced the cast HERE. *Tidbit: If you haven't guessed by now, Jem was appointment morning television for me during my early elementary school years. And I own the first season on DVD. There. If it's not set in the 80s, with those outfits and dance moves. What's the point? Also this needs to be directed John Cameron Mitchell, I'm just stating the office on that one. Be concerned, be VERY concerned! Only one director can do this justice, John Cameron Mitchell. Without the 80s outfits, make up and dance moves, what's the point?